In the afternoon of Feb. 3, 2014, the ward on the sixth floor of Modern Cancer Hospital Guangzhou was filled with warm sunshine. When we walked in, Wilton was sitting on the bed, reading the book in his hand quietly. 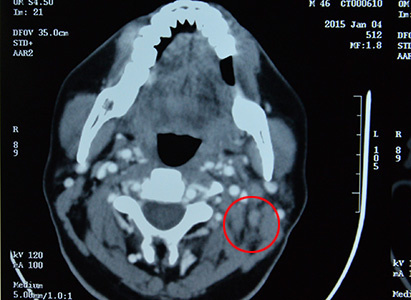 If not for the Iv drip stand beside, you would never expect he was a stage IV nasopharyngeal cancer patient. All this was contributed to the magic power of interventional therapy. 46-year-old Wilton came from Indonesia. As an experienced tour guide, he had once travelled many places in the world. 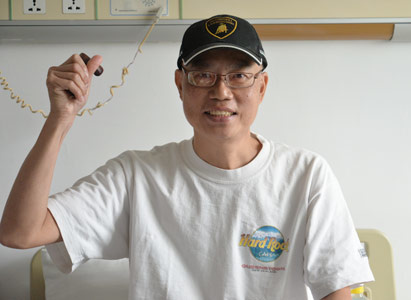 At the end of October, 2013, he was unfortunately diagnosed with nasopharyngeal cancer. After that, he received 6 times of chemotherapy in Singapore. Because the curative effect was not ideal, doctor advised him to increase the chemotherapy to 33 times and combined with radiotherapy. Hearing that, Wilton hesitated, because he did not want to take chemotherapy any more. In chemotherapy, he had serious vomit and nausea, which destroyed his health seriously. When he told the doctor his decision, it was rejected. The doctor even warned him: chemotherapy must be continued, or there would be only two months left for him. “I was very angry at that moment and also felt very stricken. Then I made a very bold decision, I went home directly and had a two-month rest, during which I was totally immersed in the happy family time. Then, two months past, but the most terrible thing did not happen”. When recalling the treatment in Singapore, Wilton shook his head to express his disappointment. Since nothing happened, Wilton decided to go on working. However, in September 2014, things got bad suddenly. 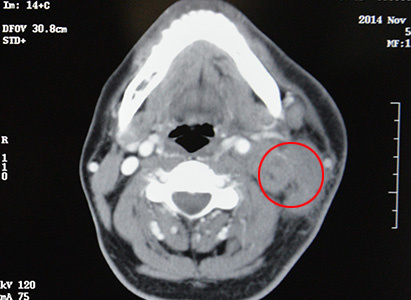 “Here it got swollen again, under my ear, and also there in the middle of my neck.” Wilton pointed the lesions to us. One day when he was listening to the radio, he noticed the advertisement of Modern Cancer Hospital Guangzhou. Because a friend’s brother had already entered into the convalescence after receiving treatment in that hospital, he decided to have a try. He went to the overseas office in Djakarta and had a free consultation here. That conversation between him and doctor here was quite satisfying, and so he decided to fly to Guangzhou in two days. At the end of the interview, Wilton shared his new plan with us. He said that after rehabilitation he would like to publish a book which records all his life experience. He wanted to write down his whole treatment to give some reference to other cancer patients. We hope his dream would come true soon.